Washington teacher candidates that wish to teach Social Studies will need to demonstrate subject mastery by becoming certified in Social Studies. To do this, you will need to plan time to adequately study for your state examination, the WEST-E Social Studies Test #028. You must register for and take this test at a proctored testing facility. 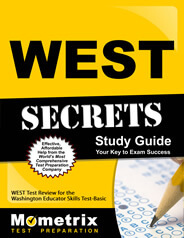 The WEST-E Social Studies Test #028 practice test is a good tool for practice. 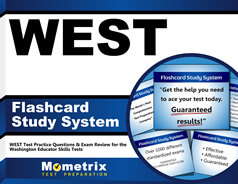 The WEST-E Social Studies test includes approximately 110 competency-based questions across six subject area domains. The questions are similar to those you will see on the WEST-E Social Studies practice test. About 16% of the test covers Civics, 12% covers Economics, 16% covers Geography, 20% covers U.S. History, 20% covers World History, and the final 16% covers Social Studies Concepts and Skills. Civics questions focus on the general purpose and functions of government, political systems, and democratic government in the United States. It also covers elections, citizenship, civic involvement, international law, and foreign policy. You will also want to study basic economic concepts, international economics, and U.S. economics. The Geography section requires you to understand maps, globes, physical features of the earth, human geography and the interactions between humans, their environments, and cultures. You will also need to have a good understanding of the geographic context of major global issues and events. The section on U.S. History covers the precontract period to 1791 and political economic, and social developments from 1791-present. This section of the test also requires competency in the area of Washington State history. Plan your studies to include questions on major world civilizations from 8000 BCE to 600 CE and from 600 to 1600. This section includes questions on major developments in world history during the Era of Global Expansion and Encounter, the Age of Revolutions, and the modern era. You will also need to have a good understanding of social studies terms, concepts, and perspectives and know how to locate social studies information. You will need to know how to apply your knowledge using critical reasoning to evaluate presentation of social studies data and be able to present, communicate, and deliberate with others regarding social studies. Use the WEST-E Social Studies practice questions as a guide for your studies. You will have 2 hours and 30 minutes for your test and you must get an overall score of 220 to become certified.